For many of us, the work we produce is intangible. It is created on computers and its distribution is entirely digital. It might not even take much human interaction to produce. Telecommuting – aka working from home – is, to many workers, one of the greatest perks of the modern information economy. A confluence of factors influenced the rise of the work-from-home culture. Advances in communications technology, a greater focus on work-life balance (especially with women firmly established in the workforce), growing traffic congestion and skyrocketing costs of homes and office space have all contributed to the growth in popularity of flexible working location arrangements over the past 25 years. Telecommuting is part of the modern economy’s move towards results-oriented work environments. The thinking goes that where you get your work done doesn’t matter so long as your work’s quality and quantity is consistent with your employer’s expectations. If you are equally or more productive when working from home or a café, then why not work there? However, telecommuting is not without its challenges. Even with the seemingly endless march of new programs and apps designed to help keep teams organized and connected regardless of their disparate geographic locations, there are often still times when it is necessary for employers to have members of their team on site. It is therefore important that employers make their right to recall telecommuting employees to the workplace explicit. An employee who is used to working from home that is suddenly expected to work from the office might argue that they have been constructively dismissed. Constructive dismissal occurs when an employer unilaterally enacts a fundamental change to the nature of an employee’s work – such as their work location – as set out in their employment contract. If an employee has been constructively dismissed they may be entitled to seek damages for wrongful dismissal. As an employer, in order to avoid such a situation, you must reserve the right to determine your employee’s workplace location. This right should be set out in employment contracts or in your workplace telecommuting policy. If you deal with requests from employees to telecommute on an ad-hoc basis, offering the opportunity to some employees and not others, you may find yourself open to charges of discrimination or favouritism. The best way to prevent these claims is to make sure you have a clearly defined process for how employees are to apply for the option to telecommute and a transparent system and consistent criteria for evaluating requests. You should decide what positions or productivity levels will qualify employees and make these eligibility requirements clear. 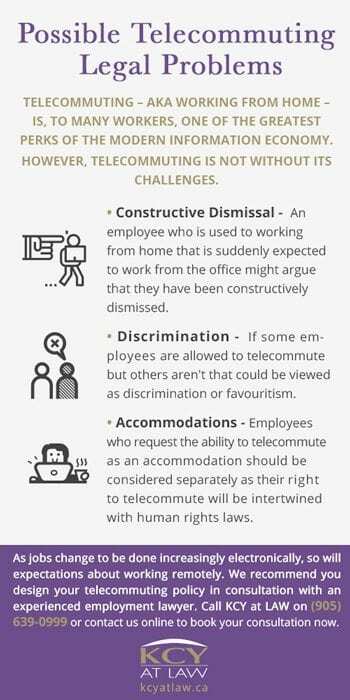 Employees who request the ability to telecommute as an accommodation should be considered separately as their right to telecommute will be intertwined with human rights laws. Employees may be faced with unexpected circumstances that make it necessary, for a period of time, to telecommute. It is your job to assess the situation and accommodate to the point of undue hardship. 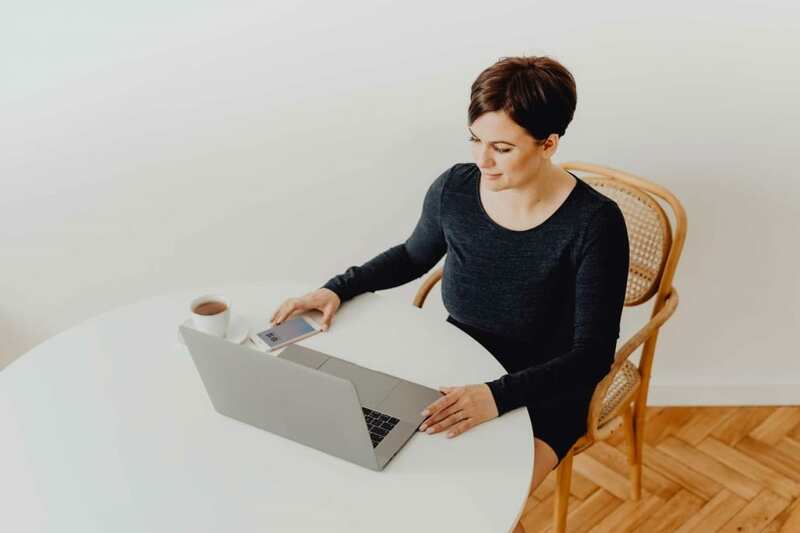 If you are considering offering telecommuting as an option to your employees, you will need a well-crafted policy to ensure that this arrangement is productive and beneficial all parties. 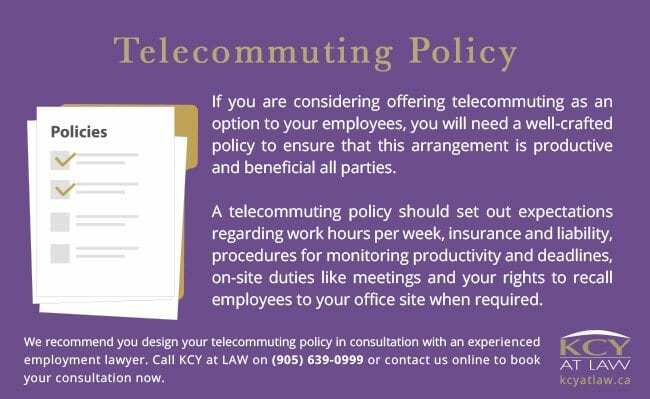 A telecommuting policy should set out expectations regarding work hours per week, insurance and liability, procedures for monitoring productivity and deadlines, on-site duties like meetings and your rights to recall employees to your office site when required. As jobs change to be done increasingly electronically, so will expectations about working remotely. We recommend you design your telecommuting policy in consultation with an experienced employment lawyer. Call KCY at LAW on (905) 639-0999 or contact us online to book your consultation.